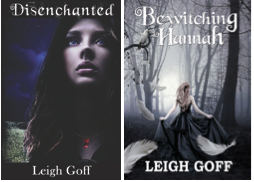 The last thing Hannah wants is to be a witch…Suspenseful, dark, romantic, and infused with magic, Bewitching Hannah is the story of a wannabe ordinary girl caught up in an extraordinary fate where deadly secrets and powerful rivals threaten her survival. Sixteen-year-old Hannah Fitzgerald has always known she was descended from a royal legacy of dark magic. Although a stranger to her coven in Annapolis, she is no stranger to grief and denial. However, when an ancient prophecy reveals the rise of a young, powerful Chesapeake witch and the impending death of another, she realizes she can no longer afford to suppress the magic that has taken away so much. She seeks out the frighteningly scarred, yet mysterious W, a Calvert descendant who is destined to change her life, but even he cannot prepare her for the danger that lies ahead. Engaged in a deadly game and not knowing whom her true rival is, Hannah isn’t certain she’ll survive, and if she loses, she may lose everything, including the ones she loves. Leigh Goff lives and writes in Annapolis, Maryland. She is a University of Maryland University College graduate, a member of the Society of Children’s Book Writers and Illustrators (SCBWI), and a volunteer with the Juvenile Diabetes Research Foundation. She is also the eighth great-granddaughter of an accused witch from the Chesapeake area.